On Shabbat Bereshit (Genesis 1:1- 6:8), Maqam RAST is applied to the prayers, according to SUHV (Red Pizmonim Book), and at least 18 other Syrian sources. This maqam, defined as 'head' in Arabic, and considered the "father of the maqamat," is typically the first maqam used in any collection (diwan) of Arabic songs. This relates here, as Bereshit is the first Torah portion, or 'head,' of Genesis. Maqam RAST is also used each Shabbat at Minha services. HAZZANUT: Naqdishakh: Hasdakh Qadam Al Kol Adam (page 145). PIZMON SEFER TORAH: Miyamim Yamima (page 125). Sephardic Pizmonim Project, www.pizmonim.com. For Shabbat Noah (Genesis 6:9- 11:32), Maqam SIGAH (more specifically, Maqam IRAQ) is applied according to most sources (other options: BAYAT or NAWAH). The word 'See-kah' is Persian for 'third.' It gets its name, because this maqam is the third note on the Arabic music scale. The explanation for a maqam that means ‘three’ is because Noah has 'three' sons or because he builds an ark with 'three' levels. The melody of this maqam is very familiar to most congregants due to its association with regular Torah readings. HAZZANUT: Qaddish: Asis El Bakh (page 441), Semehim: Eshtabeah (page 31). Sephardic Pizmonim Project, www.pizmonim.com. For Shabbat Lekh Lekha (Genesis 12:1- 17:27), Maqam SABA is selected for the services according to the Red Pizmonim Book and all other known Aleppo sources (Damascus sources cite Maqam SIGAH). This maqam has many associations, but is known by the Aleppo community as the maqam used at the Berit Mila (circumcision) ceremony, being that the Arabic word 'Sabi' means 'baby boy.' This relates to our Torah portion, because we read about the Berit Mila covenant between God and Abraham. HAZZANUT: Semehim: Yigdal Elohim Hai for Mila, Naqdishakh: Ata Ahubi (page 410). Sephardic Pizmonim Project, www.pizmonim.com. For Shabbat Vayera (Genesis 18:1- 22:24), Maqam NAWAH is applied to the prayers according to the majority of Aleppo sources, though many will go with the minority opinion, Maqam BAYAT. H Moshe Ashear (1877-1940) used to mix both maqams for this week. NAWAH is familiar to most as the maqam that we use each week for Qabbalat Shabbat. Gabriel A Shrem used to say that in Psalms 93:5, the words "Nawah Qodesh" allude to the angels (מלאכים); ornaments to God's throne and who proclaim His holiness. This connects to our Torah portion, because we read about the three “angels” who visit Abraham. Sephardic Pizmonim Project, www.pizmonim.com. On Shabbat Haye Sarah (Genesis 23:1- 25:18), Maqam HIJAZ, which is named after the Arabian Peninsula, is applied to the Shabbat morning prayers according to the Red Pizmonim Book and all Aleppo sources. This maqam, reserved for mourning, is warranted, because we are saddened to read about the deaths of Sarah and Abraham and their burials in Me’arat HaMakhpela in Hebron. Damascus sources indicate Maqam SABA to mark painful occasions. Sephardic Pizmonim Project, www.pizmonim.com. DATE: 3 Kislev: 1918 passing of H RAPHAEL ANTEBI TABBUSH, composer of most pizmonim in "Shir Ushbaha." Buried in Cairo. Sephardic Pizmonim Project, www.pizmonim.com. For Shabbat Toledot (Genesis 25:19- 28:9), the morning services are conducted in Maqam MAHOUR according to ALL Syrian sources. This maqam, often defined as 'defeated' in Arabic, can be described as a "high Rast," and is used when there is a victory or a reversal of fortune. This relates here, because Esav is defeated as he suffers the consequences of selling his birthright. In addition, the word 'Mahour' is similar to the Hebrew word 'Maher,' which means swift. This relates here, because in the narrative, Jacob had to act very swiftly. In the Red Pizmonim Book, this maqam is listed for only twice a year; Toledot and Balaq. HAZZANUT: Semehim: Yadekha Tanheni (page 149). Sephardic Pizmonim Project, www.pizmonim.com. For Shabbat Vayesse (Genesis 28:10- 32:3), services are conducted in Maqam AJAM (or GIRKA) according to 16 Syrian sources (dissenting opinion is SABA). Traditionally, the word 'Ajam,' meaning 'foreigner', was used to refer to the Persians. The melody of this maqam is joyous and has become associated with the wedding ceremony. This relates here, because in this Torah portion, we read about Jacob’s wedding ceremony in the House of Laban. HAZZANUT: Semehim: Yedidi Ro'ee Meqimi (page 417); mentions Rachel coming with her sheep. Sephardic Pizmonim Project, www.pizmonim.com. For Shabbat Vayesse (Genesis 28:10- 32:3), the morning services are conducted in Maqam AJAM (or GIRKA) according to 16 Syrian sources. A dissenting opinion is SABA. Traditionally, the word 'Ajam,' meaning 'foreigner', was used to refer to the Persians. The melody of this maqam is happy and joyous and has become associated with the wedding ceremony. This relates here, because in the narrative of this week’s Torah portion, we read about Jacob’s wedding celebration in the House of Laban. HAZZANUT: Despite Ajam being the Maqam of the Week, there is a very old Syrian tradition of singing the pizmon “Yedidi Ro’ee Meqimi” (SUHV page 417), by H Israel Najara (Damascus, 1555- Gaza, 1625), specifically on Shabbat Vayesse. For this Shabbat, our community, according to the notes of H Moshe Ashear (Aleppo, 1877- Brooklyn, 1940), has the tradition of applying the melody of this pizmon to Semehim Besetam. In order for this to take place, the cantor has to switch from Maqam AJAM to Maqam SABA right before Semehim Besetam. “Yedidi Ro’ee Meqimi” (acrostic: ישראל חזק) is a poem that compares the Almighty to a shepherd who takes care of a flock of scattered sheep. The sheep (צאן), which are mentioned at the end of all 9 stanzas, are a metaphor to the people of Israel. The role of the shepherd is used many times throughout the Bible (Genesis, 1 Samuel, Jeremiah, Psalms, etc.) as an appropriate depiction of how God takes care of the Jewish people. It is God, our shepherd, who will rescue Israel, the sheep, from all of her enemies and who will eventually gather the scattered people back to the Holy Land to build the Temple. This relates to the Torah portion of Vayesse due to the reference in the last stanza to Genesis 29:9 when Rachel comes out with her father’s sheep (ורחל באה עם הצאן). When Jacob was a wandering refugee, escaping the wrath of his brother, Esav, he was in a very low position and was looking for salvation. It wasn’t until he spotted Rachel, the daughter of Laban, that he found the necessary spark of hope needed to help facilitate moving into the future. For Shabbat Vayishlah (Genesis 32:4- 36:43), Maqam SIGAH-IRAQ is listed in 11 sources, BAYAT or HOSENI is listed in 9 sources, and Maqam SABA is listed in 6 sources. The selection of SUHV (Red Pizmonim Book) is Maqam SABA or SIGAH. An explanation for SABA (Hebrew: army), the maqam used at the Berit Mila, is because Jacob prepares for war as Esav's army approaches. Another explanation for SABA is because in Genesis 34, the Hivites are deceived into undergoing circumcisions in order to join the House of Jacob. An explanation for SIGAH, a maqam associated with the building of the tabernacle, is because in Bet El, Jacob fulfills his vow of building an altar (i.e. Tabernacle). SIGAH is familiar to most congregants as the maqam used for public Torah readings. Sephardic Pizmonim Project, www.pizmonim.com. On Shabbat Vayesheb (Genesis 37:1- 40:23), services are conducted in Maqam RAHAWI-NAWAH (based on the older sources) or NAHWAND (based on the newer sources). A reason for RAHAWI-NAWAH is in order to incorporate the pizmon, Yassa Limlokh (page 363), into one of the pieces of prayers (i.e. Semehim or Mimissrayim). This pizmon, composed by H Israel Najara (1555-1625), is a poetic depiction of the story of Joseph. A reason for NAHWAND, a maqam that carries the unsettling mood of conflict, is because there is family tension between Joseph and his brothers. PIZMON SEFER TORAH: Odekha El Tobot (page 372); in anticipation of Hannukah. Sephardic Pizmonim Project, www.pizmonim.com. For Shabbat Miqes (Genesis 41:1- 44:17), Maqam SIGAH is applied according to all Aleppo sources, because we are celebrating Hanuka, the festival of the Menora. Maqam Sigah is familiar to most, because it is used for Torah Readings. There is a connection between the Torah and light, as it says in Proverbs, "Ki Ner Missva VeTorah Or." Whenever there is a reference to the Menora, SIGAH is applied, because Yebiun Sefatai Shira (page 472A), a pizmon that mentions the Menora, is in this maqam, and is traditionally applied for Nishmat. PIZMON SEFER TORAH: Yassa Limlokh MiBet Surim (page 363). Sephardic Pizmonim Project, www.pizmonim.com. For Shabbat Miqes (Genesis 41:1- 44:17), Maqam SIGAH is applied according to all Aleppo sources in commemoration of Hannukah, the festival of the Menora (Damascus sources indicate RAHAWI-NAWAH). SIGAH is familiar to most, because it is the maqam used for all public Torah recitations. There is a connection between the Torah and light, as it says in Proverbs, "Ki Ner Missva VeTorah Or." Whenever there is a reference to the Menora, SIGAH is applied, because Yebiun Sefatai Shira (SUHV page 472A), a pizmon about the Menora, is in this maqam, and is traditionally applied for Nishmat. For the same reason, as per the notes of H Moshe Ashear (Aleppo, 1877 - Brooklyn, 1940), this melody is also applied on Shabbat Tessave and Shabbat Behaalotekha (two other weeks that are associated with the Menora). According to Aleppo custom, also noted by H Moshe Ashear, an important pizmon, Yassa Limlokh Mibet Surim (page 363) is sung as the Sefer Torah is brought out to the Tebah (table). This pizmon, classified as Maqam Nawah, can also be applied for the following pieces of prayers: Rau Banim (Friday night of either Shabbat Vayesheb or Miqes), Semehim or Mimisrayim (typically on Shabbat Vayesheb). "Yassa Limlokh Mibet Surim" (acrostic: ישראל בר משה בר לוי חזק), authored by H Israel Najara (Damascus, 1555 - Gaza, 1625), is a retelling of the miraculous Joseph saga (Genesis 39-41) in poetic form. There are 16 stanzas in this poem and as a rule, the first three phrases of each stanza rhyme with the last phrase of the preceding stanza. For example: AAAB- BBBC- CCCD etc. Although the story of Joseph's rise to power is discussed in Genesis 39-41, much of the details mentioned in this poem are based on classical Midrashic literature. The last two stanzas of this poem indicate to the reader that the story of Joseph is a source of inspiration for our people; a people who experienced the hardships of poverty (אביון) and oppression (עבד) throughout the ages. The last stanza, חזק, is the call for redemption of our nation and the hope that God will raise us just like He raised Joseph from the dust of poverty to the power of royalty. For Shabbat Vayigash (Genesis 44:18- 47:27), Maqam BAYAT is applied according to at least 17 Aleppo sources (dissenting options include: Maqam SABA, MAHOUR, or SIGAH). The definition of the Arabic word 'BAYAT' is an oath of allegiance to an emir when one submits themselves and pledges loyalty. In our case, the BAYAT is performed by Judah who submits himself completely to Joseph (the emir) and declares loyalty to him. Similarly, Maqam BAYAT is used at a Bar Missvah, because this is when one makes the BAYAT commitment to be loyal to God and to observe the commandments. Sephardic Pizmonim Project, www.pizmonim.com. On Shabbat Vayehi (Genesis 47:28- 50:26), Maqam HIJAZ is applied to the prayers according to all Aleppo sources. The dissenting opinion of Maqam SABA is cited by Damascus sources. This maqam gets its name from the 'HEJAZ' region, which is the western province of the Arabian Peninsula. This location includes Mecca and Medina, holy to the Islamic faith, as well as Jeddah, the second largest city in Saudi Arabia. The melody of this maqam is associated with sad events, such as funerals. It is warranted here, because we read about the death of Jacob and his funeral procession. Sephardic Pizmonim Project, www.pizmonim.com. For Shabbat Shemot (Exodus 1:1- 6:1), Maqam RAST is traditionally applied to the prayers according to SUHV (Red Pizmonim Book) and at least 20 other sources. This maqam, defined as 'head' in Arabic ('Ras'), represents a beginning, and is applied when we begin a new book. This relates here, because Shemot is the first Torah portion in the Book of Exodus. Dissenting opinion of using Maqam BAYAT (~16 sources), which sounds like the word 'bat' (daughter), is of significance, because Pharaoh allows all the Hebrew daughters ('bat') to live. PIZMON SEFER TORAH: El Me'od Na'ala (page 266); reference to Moshe and Aaron, both introduced in this week's portion. Sephardic Pizmonim Project, www.pizmonim.com. For Shabbat Vaera (Exodus 6:2- 9:35), the prayers are conducted in Maqam BAYAT-HOSENI according to SUHV (Red Pizmonim Book) and at least 13 other Syrian sources. HOSENI (Arabic: 'beautiful') is often described as "a high Bayat" and is applied when there is an aspect in the perasha relating to Matan Torah. We are reminded of the beauty of Matan Torah at the opening of this perasha when we read the words "Ani Adonai" which is similar to the opening of the Ten Commandments (Anokhi Adonai). Dissenting opinion is to apply Maqam NAWAH in order to sing Mi Yemallel (page 361), a pizmon about the ten plagues. Sephardic Pizmonim Project, www.pizmonim.com. For Shabbat Bo (Exodus 10:1- 13:16), the third perasha of Exodus, morning services are conducted in Maqam SIGAH (Persian: "third") according to the Red Pizmonim Book and at least 9 other sources. While the Egyptians were afflicted with three days of darkness, the Israelites had 'light' in all their dwellings. Some commentators note that this is actually the light of the Torah. SIGAH relates to the Torah, because it is the maqam applied for the public chantings of the Torah. Other opinions for this Shabbat include Maqam RAST or RAHAWI-NAWAH (similar to Shabbat Hagadol). PIZMON SEFER TORAH: Mi Yemallel (page 361); a song about the ten plagues and the festival of Pesah. Sephardic Pizmonim Project, www.pizmonim.com. DATE: 8 Shebat: 2006 passing of SAM CATTON, founder of Sephardic Heritage Foundation. Sephardic Pizmonim Project, www.pizmonim.com. For Shabbat Bo (Exodus 10:1- 13:16), the third perasha of Exodus, services are conducted in Maqam SIGAH (Persian: "third") according to SUHV (Red Pizmonim Book) and at least 13 other sources. While the Egyptians were afflicted with 3 days of darkness, the Israelites had 'light' in their dwellings. Some commentators say that this was the light of the Torah. SIGAH relates to the Torah, because it is the maqam applied for public Torah readings. Other sources for this Shabbat include: RAST (9) or RAHAWI-NAWAH (5). H Moshe Ashear's opinion, based on his Hazzanut notes, is to apply similar pieces to what he would use for Shabbat Hagadol; a mixture of BAYAT, NAHWAND, RAHAW, and NAWAH. As per the Hazzanut notes of H Moshe Ashear, this song is reserved for Shabbat Bo and Shabbat Hagadol (the Shabbat prior to the Pesah festival). This pizmon (acrostic: מרדכי) is composed by H Mordekhai Abadi (born Aleppo, 1826, - deceased Jerusalem, 1884), author of "Dibre Mordekhai," and other Halakha responsa. There are a total of 5 stanzas in this pizmon; corresponding to מ-ר-ד-כ-י. "Who can recount the strengths and wonders of the most perfect and wise?" the poem begins, and then proceeds to list all the different miracles that God orchestrated as the Children of Israel leave Egypt. Starting with the third stanza, the 10 plagues that occurred in Egypt are poetically described. In the last verse, after the festival of Pesah is mentioned, there is a reference to the belief that Pesah, a time of a previous redemption, will be the season in the future when "we will be redeemed, with the power of God, and ascend to the good mountain" (i.e. to Temple Mount and the Beit Hamiqdash). On Shabbat Beshalah (Exodus 13:17- 17:16), also called Shabbat Shira, we read the Song of the Sea (Shirat Hayam). Therefore, AJAM, the maqam known for its joyous melodies, is applied according to ALL sources. The melody of Maqam AJAM is familiar to many, because it is the Arabic equivalent to the Western Major scale. Excluding Yom Tob festivals, this is one of only three Shabbats of the year that this maqam is applied. HAZZANUT: Shirat Hayam in Zemirot recited in unison. Semehim: Ya El Gadol VeNedar (page 397); for Tu Bishbat. PIZMON SEFER TORAH: Rahum Ata (page 216). Sephardic Pizmonim Project, www.pizmonim.com. On Shabbat Beshalah (Exodus 13:17- 17:16), also referred to as Shabbat Shira, we read about the Song of the Sea (Shirat Hayam) in the Torah portion. Therefore, AJAM, the maqam best known for its happy and joyous melodies, is applied according to ALL Syrian sources. The melody of Maqam AJAM is familiar to many, because it is the Arabic equivalent to the Western Major scale. Excluding the holidays, this is one of only three Saturdays of the year that AJAM is applied. HAZZANUT: Shirat Hayam in Zemirot recited in unison. Semehim: Ya El Gadol VeNedar (page 397); in honor of upcoming Tu Bishbat. As per the notes of H Moshe Ashear, this song is traditionally reserved for Shabbat Beshalah (Shabbat Shira), and the Seventh Day of Pesah. There are a total of 4 stanzas in this pizmon; corresponding to ר-פ-א-ל. The melody of this pizmon is called "Bafta Hindi." This pizmon (acrostic: רפאל) is by the legendary composer H Rephael Antebi Tabbush (born Aleppo, ~1830 - deceased Cairo, 1918), author of the "Shir Ushbaha" pizmonim book (1888). "Merciful are You for redeeming us from captivity," the pizmon opens; referring specifically to the captivity of slavery under the Pharaoh. The second verse is a prayer to redeem us now and to send Eliahu the Prophet to herald the redemption. After we hear of the redemption, the third verse says that we will sing praises to God. The fourth verse specifically mentions how on the seventh day after the Exodus, God rescued our nation by overpowering the forces of nature by splitting the Red Sea. For Shabbat Yitro (Exodus 18:1- 20:23), the prayers are conducted in Maqam HOSENI according to SUHV (Red Pizmonim Book), and the vast majority of Syrian sources. The highlight of the Torah Reading is the story of Matan Torah; receiving the Ten Commandments. HOSENI, the maqam that means "beautiful" in Arabic, alludes to the Torah's "beauty." Hoseni, which is described as "a high Bayat," is also applied in association with Shabuot, the festival that commemorates receiving the Torah. HAZZANUT: Naqdishakh: Da'at UmZima (page 334). PIZMON SEFER TORAH: Ahallel VeAbia (page 220). Sephardic Pizmonim Project, www.pizmonim.com. For Shabbat Mishpatim (Exodus 21:1- 24:18), services are conducted in Maqam NAWAH (~6 sources) or SABA (~11 sources). NAWAH, the maqam applied for Qabbalat Shabbat, is appropriate, because like Shabbat, when God worked for six and then rested on seven, similarly the Hebrew slave works for six and then rests on seven. Another option is to apply Maqam SABA ('Sabi,' in Arabic, means baby boy), which is used to mark 'berit' or covenant. This connects here, because Israel has committed to observing the laws mentioned with "Dam HaBerit" (Exodus 24:8), or blood of the covenant. Sephardic Pizmonim Project, www.pizmonim.com. For Shabbat Teruma (Exodus 25:1- 27:19), prayers are conducted in Maqam BAYAT-HOSENI according to the Red Pizmonim Book and at least 11 sources, because we are introduced to the mishkan (tabernacle) and the miqdash (sanctuary). The centerpiece of the tabernacle is the Ark of the Covenant (aron) where the Torah (edut) is placed. Since the mishkan, and specifically, the Torah, is of great beauty, Maqam HOSENI, the Arabic word for 'beauty', is applied. The melody of HOSENI can be described as "a high Bayat." Despite the above, there are at least 15 dissenting sources that cite to apply Maqam SABA. Sephardic Pizmonim Project, www.pizmonim.com. For Shabbat Tessave (Exodus 27:20- 30:10), the morning prayers are conducted in Maqam SIGAH according to all Aleppo sources. The perasha opens with the instruction to take olive oil and kindle the eternal light (Ner Tamid). There is a connection between the Torah and light; as it states in Proverbs 6:23, "Ki Ner Missvah VeTorah Ohr." SIGAH relates to the Torah, because it is the maqam applied for the melody of chanting the Torah. HAZZANUT: Nishmat: Yebiun Sefatai Shirah (discusses the Menora). Most of the time, Tessave is associated with Shabbat Zakhor, but not this year. Sephardic Pizmonim Project, www.pizmonim.com. For Shabbat Tessave (Exodus 27:20- 30:10), the morning prayers are conducted in Maqam SIGAH according to all Aleppo sources. The perasha opens with the commandment to take olive oil and kindle the eternal light (Ner Tamid). There is a connection between the Torah and light; as it states in Proverbs 6:23, "Ki Ner Missvah VeTorah Ohr." SIGAH relates to the Torah, because it is the maqam applied for the melody of chanting the Torah. HAZZANUT: Nishmat: Yebiun Sefatai Shirah (discusses the light of the Menora). This song is also appropriate for Shabbat Miqes (Shabbat Hanukka), and Shabbat Behaalotekha. This year, Shabbat Tessave is also Shabbat Zakhor, the Shabbat prior to Purim. Coincidentally, SIGAH is also the maqam appropriate for Shabbat Zakhor (whether or not it falls on Shabbat Tessave). There are a number of explanations for this. A practical explanation to this is because the vast majority of the pizmonim for Purim are in this maqam. A secondary explanation of how SIGAH relates to Purim is because in the days of Mordekhai, the Jews repented and returned to the Torah (Talmud Shabbat 88a). In addition, when it says in Esther 8:16 that the Jews had "light", this is specifically alluding to the light of the Torah. 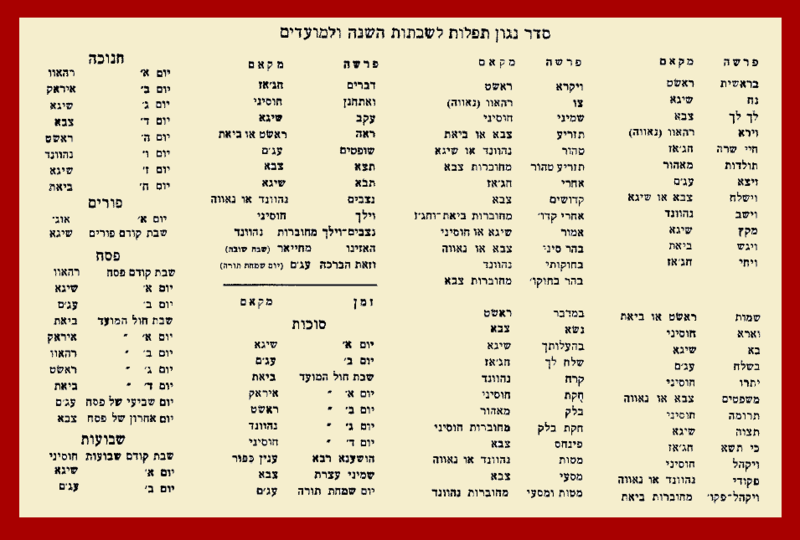 To commemorate this time, a very unique Hazzanut list, as documented by H Moshe Ashear (1877-1940), has been traditionally used by the cantors of our community for the Shabbat morning prayers. Most, if not all, of these melodies can be found of www.pizmonim.com. On Shabbat Ki Tisa (Exodus 30:11- 34:35), Maqam HIJAZ is applied according to all Aleppo sources. The dissenting opinion of Maqam SABA is cited by Damascus sources. This maqam gets its name from the 'HEJAZ' region, which is the western province of the Arabian Peninsula. This location includes Mecca and Medina, holy to the Islamic faith, as well as Jeddah, the second largest city in Saudi Arabia. The melody of this maqam is associated with sad events, such as funerals. It is warranted here, because we read about the story of the Golden Calf and the deaths of many people associated with it. Sephardic Pizmonim Project, www.pizmonim.com. DATE: 24 Adar I: 2016 passing of MEYER "MICKEY" KAIREY, a great teacher and community leader. For Shabbat Vayaqhel (Exodus 35:1- 38:20), the morning prayers are conducted in Maqam BAYAT-HOSENI according to SUHV (Red Pizmonim Book) and most other Aleppo sources. Maqam Hoseni (Arabic for 'beautiful') is applied, because we read about the culmination of the building of the mishkan (tabernacle); a place of great 'beauty'. This explanation is the same for Shabbat Teruma and Shemini. The melody of Hoseni is often described as a higher version of Maqam Bayat. Damascus sources cite Maqam AJAM or MAHOUR for this Shabbat. PIZMON SEFER TORAH: Miqdash Bene Bo (page 171). Sephardic Pizmonim Project, www.pizmonim.com. For Shabbat Pequdei (Exodus 38:21- 40:38), the last perasha of Sefer Shemot, the prayers are conducted in Maqam NAWAH according to most Aleppo sources. This maqam, as per Aleppo custom, symbolizes an ending or a completion; whether it be the completion of the book (i.e. Sefer Shemot), the week (i.e. Shabbat) or the completion of the tabernacle (this Torah portion). Maqam NAWAH is recognized by most as the melody used for Qabbalat Shabbat. HAZZANUT FOR SHABBAT PRECEDING ZAKHOR: Semehim: Azkir Hasde El (pizmon in Maqam SABA; in honor of upcoming Purim). Sephardic Pizmonim Project, www.pizmonim.com. For Shabbat Vayaqhel-Pequdei (Exodus 35:1- 40:38) combined, the morning prayers are conducted in Maqam BAYAT-HOSENI according to SUHV (Red Pizmonim Book) and most other Aleppo sources. Maqam Hoseni (Arabic for 'beautiful') is applied, because we read about the culmination of the building of the mishkan (tabernacle); a place of great 'beauty'. This explanation is the same for Shabbat Teruma and Shemini. The melody of Hoseni is often described as a higher version of Maqam Bayat. Sephardic Pizmonim Project, www.pizmonim.com. For Shabbat Vayaqhel-Pequdei (and Shabbat HaHodesh) the prayers are conducted in Maqam BAYAT-HOSENI, according to SUHV (Red Pizmonim Book) and most other Aleppo sources. Maqam Hoseni (Arabic for 'beautiful') is applied, because we read about the mishkan (tabernacle); a place of great 'beauty'. This explanation is the same for Shabbat Teruma and Shemini, which also discuss the mishkan. The melody of Hoseni is often described as a high version of Maqam Bayat. HAZZANUT: Special for Shabbat HaHodesh (as per H Moshe Ashear): Semehim: Ashir LeEl Ayom; song on page 256, mentioning the 12 months of the year. This important pizmon was recently found by the Sephardic Pizmonim Project, and a recording by H Daniel Binker Dwek of Buenos Aires can be found on www.pizmonim.com. On Shabbat Zakhor, Maqam SIGAH is applied to the prayers. A practical explanation for Sigah is because the majority of pizmonim for Purim, as well as the Iraqi chanting of Megillat Esther, are in this maqam. Another explanation is that in the days of Mordekhai, the Jews repented and returned to the Torah (Talmud Shabbat 88a). When it says in Esther 8:16 that the Jews had "light", this is specifically alluding to the light of the Torah. Therefore, to remember this great event and the miracles of Purim, SIGAH, the maqam used for Torah chanting, is applied. HAZZANUT: Semehim: Abarekh Et Shem (459). Sephardic Pizmonim Project, www.pizmonim.com. On Shabbat Vayiqra (Leviticus 1:1- 5:26), Maqam RAST is applied to the prayers, according to the Red Pizmonim Book, and at least 18 other sources. This maqam, defined as 'head' in Arabic (ras), and considered the "father of the maqamat," is always the first maqam used in any collection of Arabic songs. This relates here, as Vayiqra is the first perasha, or head, of Leviticus. This maqam also relates to this Torah portion, because, metaphorically speaking, sacrificing the 'head' of an animal is considered an atonement for one's head. Maqam RAST is also used each Shabbat at Minha services. Sephardic Pizmonim Project, www.pizmonim.com. On Shabbat Sav (Leviticus 6:1- 8:36), one opinion is to apply Maqam NAHWAND, the opinion of H Moshe Ashear is to apply Maqam BAYAT, and the opinion of the older sources is to apply Maqam IRAQ. No explanations are known for how these opinions were formed. In typical years, Maqam RAHAWI-NAWAH would be applied in honor of Shabbat Hagadol and Pesah, but this is a leap year, and Shabbat Hagadol is about one month away. Sephardic Pizmonim Project, www.pizmonim.com. For Shabbat Shemini (Leviticus 9:1- 11:47), the services should be conducted in Maqam HOSENI according to SUHV (Red Book) and at least 14 other sources. This selection is based on the content of the Torah portion which deals with the inauguration of the tabernacle (mishkan). Being that the tabernacle houses the Ten Commandments, something described as "beautiful," HOSENI, a word that means 'beautiful' in Arabic, is most appropriate. The melody of Hoseni is often described as a higher version of Maqam Bayat. Dissenting opinion: NAHWAND (H Moshe Ashear). Sephardic Pizmonim Project, www.pizmonim.com. For Shabbat Tazria (Leviticus 12:1- 13:59), there are two options in SUHV for the Maqam of the Week: Maqam SABA or BAYAT. Maqam SABA should be applied, because the perasha begins with the circumcision of the baby boy on the eighth day. In our tradition, Saba ("Sabi" in Arabic means 'boy') is reserved for the Berit Mila. The majority of sources, however, indicate to apply Maqam BAYAT. An explanation for Maqam Bayat is because the perasha opens with the laws of a mother when she gives birth. Maqam Bayat is said to symbolize women and therefore is most appropriate here. Sephardic Pizmonim Project, www.pizmonim.com. On Shabbat Hagadol, which is the Shabbat before the Pesah festival, the morning prayers are conducted in Maqam RAHAW (NAWAH), according to all Syrian sources. The usage of Maqam Rahaw is associated with this Shabbat, because it is the maqam applied for the Haggadah Shel Pesah. HAZZANUT: Semehim: Emunim Irkhu Shebah (page 359); very old pizmon associated with the Seder of Pesah. PIZMON SEFER TORAH: Mi Yemallel (page 361). HAFTARA: According to Aleppo custom, the regular Haftara of Shabbat Sav is read (Jeremiah 7:21–8:3; 9:22–23). Sephardic Pizmonim Project, www.pizmonim.com. On the Seventh Day of Pesah, we read the Song of the Sea (Shirat Hayam). Therefore, AJAM, the maqam known for its joyous melodies, is applied according to ALL sources. The melody of Maqam AJAM is familiar to many, because it is the Arabic equivalent to the Western Major scale. HAZZANUT: Shirat Hayam in Zemirot recited in unison. PIZMON SEFER TORAH: Rahum Ata (page 216). Sephardic Pizmonim Project, www.pizmonim.com. On the Eighth Day of Pesah, services are conducted in Maqam SABA according to most sources. This is the maqam typically reserved for the Berit Milah (circumcision ceremony). An explanation for applying SABA on the eighth day of Pesah (as well as Sukkot) is because the number 8 is heavily associated with "Berit," the covenant. Despite the indirect association with the Berit Milah, no Berit Milah melodies are to be applied to the prayers on this holiday. PIZMON SEFER TORAH: Ata Marom (page 435). Sephardic Pizmonim Project, www.pizmonim.com. For Shabbat Tahor (Leviticus 14:1-15:33), Maqam SIGAH or NAHWAND should be applied according to most sources. An explanation for Maqam SIGAH is because the perasha deals with many rituals of holiness, and Maqam Sigah is used to mark rituals. An explanation for Maqam NAHWAND is that leprosy is associated with Lashon Hara (i.e. Miriam's punishment), and this is why the maqam that portrays disharmony and conflict is applied. Sephardic Pizmonim Project, www.pizmonim.com. For Shabbat Ahare Mot, Maqam HIJAZ is applied according to most Syrian sources, except those from Damascus, which list Maqam SABA. This maqam gets its name from the 'HEJAZ' region, which is the western province of the Arabian Peninsula bordering the Red Sea. This location includes Mecca and Medina, holy to the Islamic faith, as well as Jeddah, the second largest city in Saudi Arabia. The melody of this maqam is associated with sad events, such as funerals. It relates here, because we open the Torah reading with the deaths of Nadab and Abihu, the two children of Aharon. Sephardic Pizmonim Project, www.pizmonim.com. For Shabbat Qedoshim (Leviticus 19:1- 20:27), the prayers are conducted in Maqam SABA, according to at least 11 different Aleppo sources. An explanation for this maqam is because we open with God's command "to be holy." According to the commentators, "holiness" is defined as refraining from sexual promiscuity (as referenced in surrounding passages; Leviticus 18 & 20). The Berit Mila is often used as the symbol of chastity and holiness. Being that Maqam Saba is associated with the circumcision, it is also connected here where we are reminded to conduct our lives in holiness. Sephardic Pizmonim Project, www.pizmonim.com. For Shabbat Emor (Leviticus 21:1- 24:23), which most years is the Shabbat prior to Lag La'Omer, prayers are conducted in Maqam SIGAH. The main reason for applying SIGAH is because the flagship song for Lag LaOmer, Bar Yohai (61), is in this maqam. This song has both a slow and a fast version; both of which can be applied to the pieces of prayers. Maqam SIGAH will be familiar to most congregants as the maqam applied for Torah readings. On years that Shabbat Emor is not the Shabbat prior to Lag LaOmer, Maqam SIGAH or HOSENI/ASHIRAN should be applied (without including Bar Yohai). Sephardic Pizmonim Project, www.pizmonim.com. For Shabbat Behar (Leviticus 25:1-26:2), prayers are chanted in either Maqam SABA or NAWAH. SABA may be an option, because the words "Behar Sinai," which is the place where we were given the Torah, symbolizes the covenant between God and Israel. Maqam SABA is the maqam generally applied for recalling covenants; such as the Berit Mila covenant. NAWAH may be an option, because Nawah is the maqam for Qabbalat Shabbat, and Behar starts off with the concept of working the land for six years and allowing it to rest on the Sabbatical year (Shemita is similar to Shabbat). Sephardic Pizmonim Project, www.pizmonim.com. For Shabbat Behuqotai (Leviticus 26:3- 27:34), the last portion of Leviticus, prayers are conducted in Maqam NAWAH according to most Aleppo sources. This maqam symbolizes an ending; whether it be the ending of a week (Qabbalat Shabbat) or of a book (Sefer Vayiqra). Another option is NAHWAND, a maqam which expresses the mood of discomfort. This mood is appropriate, because this portion contains the passages of the curses. HAZZANUT: Semehim: Yerushalayim Shel Zahav (for Yom Yerushalayim). DATE: 25 Iyar: 2005 passing of CHARLIE SEROUYA, beloved leader of Young Magen David. Sephardic Pizmonim Project, www.pizmonim.com. 2018 - For Shabbat Tazria-Tahor (Leviticus 12:1- 15:33), there are two options in SUHV for the Maqam of the Week: Maqam SABA or BAYAT. Maqam SABA should be applied, because the perasha begins with the circumcision of the baby boy on the eighth day. In our tradition, Saba ("Sabi" in Arabic means 'boy') is reserved for the Berit Mila. The majority of sources, however, indicate to apply Maqam BAYAT. An explanation for Maqam Bayat is because the perasha opens with the laws of a mother when she gives birth. Maqam Bayat, from the Hebrew word "Bat," is said to symbolize women and therefore is appropriate here. Sephardic Pizmonim Project, www.pizmonim.com. 2018 - For Shabbat Ahare Mot-Qedoshim (Leviticus 16:1- 20:27), the appropriate maqam, according to all Aleppo sources, is HIJAZ, in order to mourn the deaths of Aaron's sons, Nadab and Abihu. Maqam HIJAZ, named after the Arabian peninsula, is generally applied in the Syrian tradition to evoke the mood of death and sadness. Damascus custom is to only apply Maqam Hijaz for extreme sadness, such as Shabbat Ekha; when we mourn the destruction of the Bet Hamiqdash. One opinion, favored by Cantor Gabriel A Shrem, is to mix Maqam BAYAT with HIJAZ when Ahare Mot and Qedoshim are combined. Sephardic Pizmonim Project, www.pizmonim.com. 2018 - This week is Shabbat Emor, but because Lag LaOmer has already passed, no melodies for this observance (namely Maqam Sigah for the pizmon "Bar Yohai") will be applied to the prayers. The Red Book (SUHV) lists Maqam Hoseni or Sigah as options, but virtually all the Aleppo sources from the nineteenth century list Maqam ASHIRAN, a maqam within the BAYAT family, as the Maqam of the Week. The opinion documented in the Hazzanut notes of H Moshe Ashear for a similar scenario in 1937 is to apply Maqam MAHOUR for this Shabbat. Sephardic Pizmonim Project, www.pizmonim.com. 2017- For Shabbat Behar-Behuqotai (Leviticus 25:1- 27:34), the last portions of Leviticus, prayers are conducted in Maqam NAWAH according to most Aleppo sources. This maqam symbolizes an ending; whether it be the ending of a week (Qabbalat Shabbat) or of a book (Sefer Vayiqra). Another option is NAHWAND, a maqam which expresses the mood of discomfort. This mood is appropriate, because this portion contains the passages of the curses. HAZZANUT: Semehim: Yerushalayim Shel Zahav (for Yom Yerushalayim). Sephardic Pizmonim Project, www.pizmonim.com. 2018- For Shabbat Behar-Behuqotai combined (Leviticus 25:1-27:34), prayers are conducted in Maqam NAWAH or NAHWAND. NAWAH may be an option, because Nawah is the maqam for Qabbalat Shabbat, and Behar starts off with the concept of working the land for six years and allowing it to rest on the seventh year (Shemita is similar to Shabbat). NAHWAND may be an option in order to apply melodies to celebrate the upcoming Yom Yerushalayim. HAZZANUT: Semehim: Yerushalayim Shel Zahav (page 208a). Sephardic Pizmonim Project, www.pizmonim.com. On Shabbat Bemidbar (Numbers 1:1- 4:20), Maqam RAST is traditionally applied to the prayers, according to SUHV (Red Pizmonim Book), and at least 18 other Syrian sources. This maqam is considered the "father of the maqamat," is typically the first maqam used in a collection (diwan) of Arabic songs. This relates here, as Bemidbar is the first Torah portion, or head, of the Book of Numbers. This also relates to the content of the Torah portion, because Moses is commanded to count the 'heads' of Israel, and the word 'RAS' means 'head' in Arabic. Maqam RAST is also used each Shabbat at Minha services. Sephardic Pizmonim Project, www.pizmonim.com. On Shabbat Kallah, the Shabbat prior to Shabuot, Maqam HOSENI, which is described as 'a high Bayat,' is applied. When Bemidbar (Numbers 1:1- 4:20) is not linked to Shabbat Kallah, RAST is applied, because this is the first perasha of Sefer Bemidbar. Maqam Hoseni is related to Shabuot, because it is when we commemorate receiving the Torah. Since the Torah is of great 'beauty', Hoseni, the maqam that means "beauty" in Arabic, is applied. Maqam Hoseni is also used for the ta'amim of Megillat Ruth and the Ketuba of Shabuot. HAZZANUT: Semehim: Azharot, Naqdishakh: Da’at UmZima (page 334). Sephardic Pizmonim Project, www.pizmonim.com. For Shabbat Naso (Numbers 4:21- 7:89), prayers are conducted in SABA, the maqam used for a circumcision, as per ALL Aleppo sources. One reason is due to the words "Lissbo SABA" (Hebrew: ‘army’) being mentioned (Numbers 4:23). A deeper reason, however, is the connection between Sota (unfaithful wife) mentioned in Numbers 5, and the circumcision. The Berit Mila serves as a protection against infidelity so that one can maintain a good marriage. Being that this maqam is associated with circumcision, it is also used here in order to remind us to conduct our affairs properly. Sephardic Pizmonim Project, www.pizmonim.com. For Shabbat Beha'alotekha (Numbers 8:1- 12:16), the third perasha in the book, prayers are conducted in Maqam SIGAH (which means ‘third’ in Persian). This maqam, associated with priestly ceremonies and with the building of the tabernacle, is applied, because the perasha opens with the lighting of the Menora. SIGAH relates to the Torah, because it is the maqam applied for the melody of chanting the Torah. There is a connection between the Torah and light; as it states in Proverbs, "Ki Ner Missva VeTorah Or." HAZZANUT: Nishmat: Yebiun Sefatai Shira (discusses the Menora). Sephardic Pizmonim Project, www.pizmonim.com. On Shabbat Shelah (Numbers 13:1- 15:41), the prayers are conducted in Maqam HIJAZ according to the Red Pizmonim Book. Maqam HIJAZ, named after a region on the Arabian peninsula, is generally applied to display the mood of sadness. The reason for applying a maqam that symbolizes mourning is because we read about the transgression of the spies and its tragic aftermath. Despite the above opinion, most older Aleppo sources indicate to apply Maqam IRAQ, and the Jerusalem tradition indicates to apply Maqam NAHWAND. Sephardic Pizmonim Project, www.pizmonim.com. On Shabbat Qorah (Numbers 16:1- 18:32), Maqam NAHWAND is applied to the prayers according to SUHV (Red Pizmonim Book). This maqam, used to mark conflict, is selected here, as we read about Qorah's rebellion. The tradition of Aleppo was to combine Qorah with Huqat each year. In that case, Maqam HOSENI would be applied for Shabbat Qorah-Huqat. Other than Aleppo's Jewish communities of Mexico and Buenos Aires, this custom was discontinued, but Knis Ades in Jerusalem continues to apply HOSENI for Qorah as a vestige of that tradition. PIZMON SEFER TORAH: Ma Navu Ragle Mebaser (133). Sephardic Pizmonim Project, www.pizmonim.com. For Shabbat Huqat (Numbers 19:1- 22:1), Maqam BAYAT-HOSENI is applied, according to most sources (dissenting: MAHOUR or AJAM). HOSENI, the maqam used for Matan Torah, is applied, because we open with Zot Huqat HaTorah; words that reconnect us to the receiving of the Torah. Another explanation is because the description of the Red Cow "Temima," meaning perfect/flawless, is also used in Psalms 19:8 to describe the Torah. Despite this connection to the Torah, no Matan Torah melodies are to be applied to the prayers. PIZMON SEFER TORAH: Ma Neima Veyafa (page 299). Sephardic Pizmonim Project, www.pizmonim.com. For Shabbat Balaq (Numbers 22:2- 25:9), Maqam MAHOUR (ma' hur means 'defeated' in Arabic), is applied, because Balaq's efforts are defeated after Bilaam's curses are switched into blessings. This maqam can be described as "a high Rast." Some say that Mahour is applied based on the Hebrew word "maher" (quick) which is appropriate because it reflects Bilaam's quickness to pursue monetary bribes in exchange for the mission. Dissenting opinions: Maqam BAYAT (majority of Aleppo sources), NAHWAND (H Moshe Ashear), SIGAH (Amash Damascus source). Sephardic Pizmonim Project, www.pizmonim.com. On Shabbat Pinehas (Numbers 25:10- 30:1), the eighth perasha in this book, prayers are conducted in Maqam SABA according to most sources. This is because God gives a “Berit Shalom” (peace treaty) to Pinehas for his courageous actions to defend God's name. Saba is used in other cases with the mention of covenant, because this is the maqam for the Berit Mila (circumcision). According to Qabbala, Eliahu HaNabi, the witness of every Berit Mila, is associated with Pinehas due to their similarities. HAZZANUT: Semehim: Habib Allah Eliahu. PIZMON SEFER TORAH: Shelah Segani (page 480). Sephardic Pizmonim Project, www.pizmonim.com. For Shabbat Matot (Numbers 30:2-32:42), prayers are conducted in Maqam NAHWAND (named after the city, Nahavand, in the Hamadan province of Iran), because the portion begins with the laws of vows and the importance of keeping ones word. Maqam Nahwand is used in cases of conflict, so one may suggest that making vows, in general, is a source of conflict. This maqam was popular in Turkish and Persian music before making its way to Arabic music. In addition, this maqam is known for its wide variety of Western-sounding melodies. Dissenting opinion: NAWAH. Sephardic Pizmonim Project, www.pizmonim.com. For Shabbat Masei (Numbers 33:1-36:13), services are conducted in Maqam NAWAH or SABA according to most sources. NAWAH would be appropriate, because it is the maqam used for ending a Humash. Just like we use NAWAH on Shabbat to end the week, we use NAWAH to end the Humash. The melody of this maqam is the same one used for Qabbalat Shabbat. SABA is appropriate because the meaning of the word 'Saba' in Hebrew is army, and this portion lists all of the stops of the Israelite army. ALIYOT: According to our tradition, stopping in the middle of the 42 mase'ot (stops) is prohibited. Sephardic Pizmonim Project, www.pizmonim.com. For Shabbat Matot-Masei (Numbers 30:2-36:13), services are conducted in Maqam NAHWAND, because the portion begins with the laws of vows and the importance of keeping ones word. Maqam Nahwand is used in cases of conflict, so one may suggest that if one makes a vow that they cannot keep, this causes conflict. Another example of a vow in this perasha is when the tribes of Reuben and Gad, in exchange for inhabiting the eastern Jordan territories, vow to stay on the battlefield until all of Canaan is conquered. Sephardic Pizmonim Project, www.pizmonim.com. On Shabbat Ekha, as we mourn the destruction of the Holy Temple, all sources, both those from Aleppo and Damascus, unanimously agree that prayers are conducted in HIJAZ, the maqam reserved to express death, mourning, and sadness. The Damascus tradition, as well as some Aleppo sources, specifically state that this is the only Shabbat of the entire year that Maqam Hijaz may be applied. Even though, the Torah portion, Debarim (Deuteronomy 1:1- 3:22), is the first of a new book, Maqam Rast is still not applied due to the overriding importance of Tisha B’Ab. PIZMON: Elyon Al Kol Ramim (page 487). Sephardic Pizmonim Project, www.pizmonim.com. For Shabbat Vaethanan (Deuteronomy 3:23- 7:11), prayers are conducted in Maqam HOSENI (Arabic: beauty) according to all Aleppo sources (Damascus sources: RAST). The highlight of the perasha is the Ten Commandments, and therefore Hoseni is applied; alluding to the Torah’s "beauty." This maqam, named after the Persian sheikh Husseini Biadur, is described as "a high Bayat," and is also applied in association with Shabuot, the festival of receiving the Torah. HAZZANUT: Naqdishakh: Da’at UmZima (page 334). PIZMON: Re'eh Hashem Ki Sar Li (page 180); for Shabbat Nahamu. Sephardic Pizmonim Project, www.pizmonim.com. DATE: 17 Ab: 1986 passing of GABRIEL A SHREM; editor in chief of SUHV, the Red Pizmonim Book. Sephardic Pizmonim Project, www.pizmonim.com. For Shabbat Eqeb (Deuteronomy 7:12- 11:25), the third perasha of this book, the Shabbat prayers are conducted in Maqam SIGAH according to all Syrian sources except for three (which cite Maqam RAST as the option). SIGAH (from Persian "See-Kah"), literally means "third place," and is named such because on the Arabic music scale, this maqam starts on the third note (in relation the first note, which is Maqam Rast). The main theme of this perasha is the observance of the laws of the Torah, and since the Syrian melody of Torah is chanted in Maqam Sigah, this is viewed as appropriate. Sephardic Pizmonim Project, www.pizmonim.com. For Shabbat Re'eh (Deuteronomy 11:26-16:17), there are multiple opinions as to what the maqam should be. Here is the breakdown by the number of sources: BAYAT/ASHIRAN (9), RAST (9), SIGAH-IRAQ (5), NAWAH (3), NAHWAND (1), SABA (1). Although Maqam RAST is listed in Shir Ushbaha Hallel Vezimra (Red Pizmonim Book), cantors Moshe Ashear, Gabriel A Shrem, and Isaac J Cabasso, selected Maqam BAYAT in order to herald the month of Elul by applying the melody of the Selihot; the BAYAT melody of Elekha Hashem (Halabi En Kelohenu) for Semehim Besetam. Sephardic Pizmonim Project, www.pizmonim.com. For Shabbat Shofetim (Deuteronomy 16:18- 21:9), prayers are conducted in Maqam AJAM according to most sources (dissenting view: SABA). The Arabic word 'Ajami means 'foreigner' and this relates to the concept of an Israelite king; an idea originating from the foreign nations. AJAM, also used to express happiness, marks the joyous occasion of electing a new king; one whose sovereignty will be blessed with many long years and prosperity (also viewed as a positive sign for the entire nation). HAZZANUT: Nishmat: Ya'arikh Yamim (page 203). Semehim: Elekha Hashem (Selihot) in Ajam. Sephardic Pizmonim Project, www.pizmonim.com. On Shabbat Ki Tesse (Deuteronomy 21:10- 25:19), we read about the protocols of taking a female captive during a war. Maqam SABA (Hebrew: army; Arabic: baby boy), the maqam used at the Berit Mila, is appropriate here for two reasons. Firstly, because we open with the mention of an army, and the Hebrew word for 'army' is 'SABA'. But more importantly, since the ultimate purpose of the Mila is to prevent promiscuity, this connects to the soldier; reminding him that it is better for him to avoid the temptation of transgressing with female captives. HAZZANUT: Semehim: Ki Eshmera Shabbat (page 30). Sephardic Pizmonim Project, www.pizmonim.com. For Shabbat Ki Tabo (Deuteronomy 26:1- 29:8), services are conducted in Maqam SIGAH (more specifically, Maqam IRAQ), according to most Aleppo sources. The reading opens with the pilgrimage (hag) to the Temple to present the first fruits (bikurim). Since this pilgrimage is done on the three festivals, Sigah, a word that means 'third,' and the maqam used for these three holidays, is applied here. This maqam is well-known to most as the melody applied for Torah readings. HAZZANUT: Semehim: Adon Yahid Yasad (page 67); melody used in the Selihot. Dissenting views: Maqam SABA or NAWAH. Sephardic Pizmonim Project, www.pizmonim.com. For Shabbat Nissabim (Deuteronomy 29:9- 30:20), the last Shabbat of the year, services are conducted in Maqam NAWAH or NAHWAND. Nawah is applied at a conclusion, and in this case, it is the year that is being concluded. Nahwand, the maqam associated with conflict and rebuke, is also an option, because as we are "standing together," we are warned of the punishments that will happen if we veer from the proper path. HAZZANUT: Semehim: Ahot Qetana (in anticipation of Rosh Hashana). The opinion of H Moshe Ashear, as well as the Abraham Dweck source, is to apply Maqam HIJAZ for this Shabbat. Sephardic Pizmonim Project, www.pizmonim.com. When Shabbat Vayelekh (Deuteronomy 31:1-30) is Shabbat Shuba (Shabbat between Rosh Hashana and Yom Kippur), the prayers are conducted in Maqam MEHAYAR, a maqam within the Bayat family, according to the Red Book. Other sources cite to apply HOSENI, the maqam which alludes to the beauty of the Torah. A possible explanation, based on the perasha, is because Moshe writes down the Torah and gives it to the people. This is also appropriate for Shabbat Shuba, the time of year when we renew our commitment to the Torah's commandments. HAZZANUT: Semehim: Lekha Eli (in anticipation of Yom Kippur). Sephardic Pizmonim Project, www.pizmonim.com. For Shabbat Nissabim-Vayelekh (Deuteronomy 29:9- 31:30), which is the last Shabbat of the year, services are conducted in Maqam NAWAH or NAHWAND. Nawah is typically applied at a conclusion, and in this case, it is the year that is being concluded. Nahwand, the maqam associated with conflict and rebuke, is also an option, because as we are "standing together," we are warned of the punishments that will happen if we veer from the proper path. HAZZANUT: Semehim: Ahot Qetana (in anticipation of Rosh Hashana). The minority opinion of H Moshe Ashear, as well as the Abraham Dweck source, is to apply Maqam HIJAZ for this Shabbat. Sephardic Pizmonim Project, www.pizmonim.com. For Shabbat Shuba (between Rosh Hashana and Yom Kippur), the prayers are conducted in Maqam MEHAYAR, a maqam within the Bayat family, according to the Red Book. Most other sources cite to apply HOSENI, the maqam which alludes to the beauty of the Torah. A possible explanation, based on the perasha, is because Moses writes down the Torah and gives it to the people (Deuteronomy 31:9). This is also appropriate for Shabbat Shuba, the time of year when we renew our commitment to the Torah's commandments. The melody of this maqam can be described as "a high Bayat." HAZZANUT: Semehim: Lekha Eli (in anticipation of Yom Kippur). PIZMON SEFER TORAH: Shabti Shabti (page 151). Sephardic Pizmonim Project, www.pizmonim.com. When Shabbat Ha’azinu (Deuteronomy 32:1-52) falls out between Yom Kippur and Sukkot, Maqam NAHWAND is applied, according to H Moshe Ashear. This scenario is a rare occurrence that does not occur frequently and is therefore not independently mentioned in most sources. ALIYOT: Aliyot stops form the acrostic "HAZIV LAKH;" the letters that begin each aliyah (32:1, 32:7, 32:13, 32:19, 32:29, 32:40). DATE: 18 Tishri: 2 Hol Hamoed Sukkot: 1940 passing of H MOSHE ASHEAR, Chief Cantor of Congregation Magen David of 67th Street and author of "Hallel VeZimra." Sephardic Pizmonim Project, www.pizmonim.com. On Shemini Asseret, which is the eighth day of Sukkot, the prayers are conducted in Maqam SABA according to most sources (dissenting view: SIGAH). This is the maqam typically reserved for the Berit Milah (circumcision ceremony). An explanation for applying SABA on the eighth day of Sukkot (as well as Pesah) is because the number 8 is heavily associated with "Berit," the covenant. Despite the indirect association with the Berit Milah, absolutely no Berit Milah melodies are to be applied to the prayers on this holiday. PIZMON SEFER TORAH: Rokheb Abim (page 485); a pizmon about the rain. Sephardic Pizmonim Project, www.pizmonim.com. On Simhat Torah, VeZot HaBerakha (Deuteronomy 33- 34) is read, and Maqam AJAM is applied to the prayers. AJAM is a happy maqam typically reserved for a Yom Tob holiday. On this holiday, we conclude the traditional annual Torah cycle and begin the next cycle immediately with Sefer Bereshit, in order that there should never be an interruption from our Torah learning. PIZMON for Hatan Me'Onah is El Ramah Yeminekha (page 179). The pizmon, Mipi El (370), is most associated with this holiday. The Haqafot ceremony, to honor the Torah, is conducted numerous times throughout the day. Sephardic Pizmonim Project, www.pizmonim.com.